On October 30th, 2015 I have been at the Opera del Duomo Museum in Florence, exactly one day after the official re-opening. 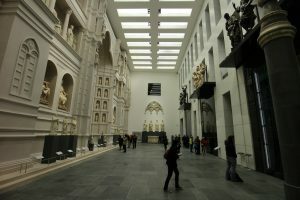 After buying new spaces, two years ago the museum started a renovation process which meant a limited access for several months, and then one full year of closing. 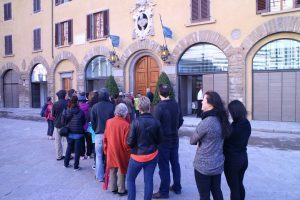 At 9:00 AM there were at least 60-70 people waiting in line to see this brand new wonder in Florence, and I was with them. Come on, I thought, this is going to become like the Uffizi. But instead, as soon as the door was opened, we all flew in immediately: after walking under an arch that was crossed (many times) by Brunelleschi and Michelangelo, you get to a large entrance room (once the courtyard of the Opera del Duomo) where who needs tickets can buy them, while who has them already can enter the museum. It’s as easy as scanning the barcode of your ticket, that you can even buy and print online. 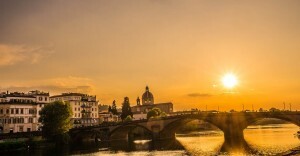 A ticket that has been raised from € 10 to € 15, but is well worth the price because it can be used (within 24 hours from the first scan) to also visit the Baptistery and the crypt beneath the Duomo and to climb Giotto’s Bell Tower and Brunelleschi’s Dome. Basically, you can visit the entire Duomo complex. Let’s go through the highlights of the museum. After scanning your ticket, you are introduced to the Duomo Museum by a corridor, where on the left you can see a “tag cloud” with the names of the great artists that contributed building and decorating the Cathedral. 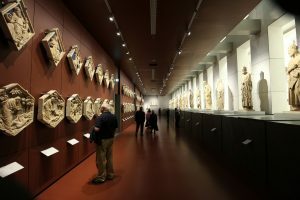 After a first room with statues and fragments that once decorated the Baptistery and the Duomo, you will get into the most amazing room of the new Opera del Duomo Museum. Here, on one side, the ancient facade of the Cathedral, left unfinished by Arnolfo Di Cambio when he died in the early 1300s, has been rebuilt and decorated with the original statues, preserved by the Opera del Duomo since 1587, when the facade was removed. 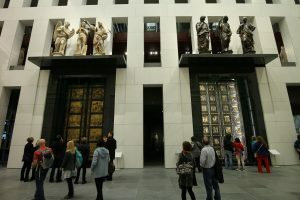 Thanks to documents and to a drawing by the painter Bernardino Poccetti made right before the original facade was torn down, it has been possible to place the statues in the correct spots. The Northern doors by Lorenzo Ghiberti (1403-1424), just restored: the 1401 competition to assign this job, between Lorenzo Ghiberti, Filippo Brunelleschi and other artists, is considered by art historians as the conventional date for the start of the Renaissance. The Eastern doors (1425-1452) again by Lorenzo Ghiberti: they’re the most recent and the most famous, and people stay in line in front of the monument just to see the copy of the doors. They are so beautiful that Michelangelo called them “The Gates of Paradise”. The Southern doors by Andrea Pisano (1300-1333). This is an empty spot at the moment, the doors will be placed here in 2017 after restoration. 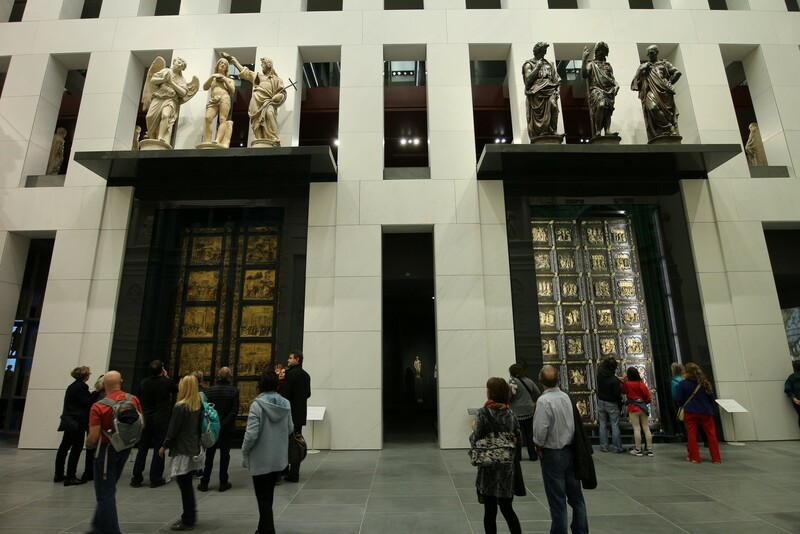 It’s not over: in this same room, you can see (fully restored) the original groups of statues that were placed above the Baptistery doors, replaced on-site with copies. The preaching of John the Baptist above the Northern doors, the Baptism of Jesus Christ above the Gates of Paradise and the beheading of John the Baptist above the Southern doors. 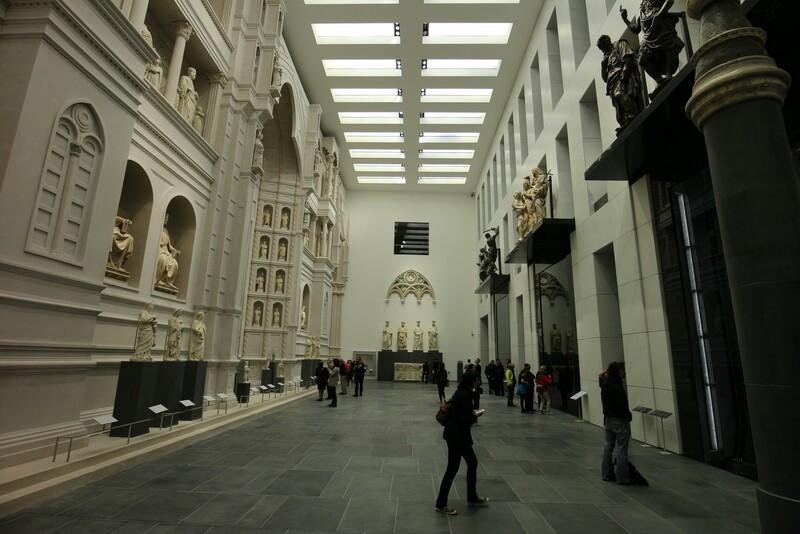 After being shocked by the beauty of this large hall, you have just a short break before reaching two more stunning rooms: one contains the statue of Mary Magdalene by Donatello, the other one displays the Bandini Pietà by Michelangelo. The statue by Donatello is one of the most incredible works of the early Renaissance. 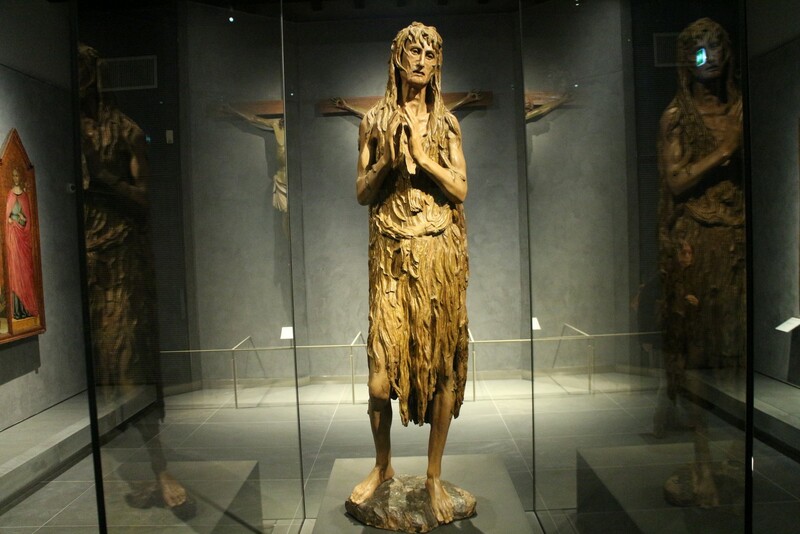 It represents Mary Magdalene as an old woman, a hermit in the desert repenting herself for her sins: if we didn’t know it was made in 1453-55, it could very well be a contemporary work of art. For once, Donatello doesn’t idealize the character representing beauty, as typical of this century, but a real woman and her desperate suffering. 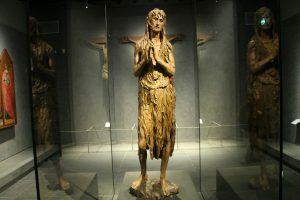 The statue, made for the Baptistery, was restored and placed in the Duomo Museum after the damage suffered for the flood in 1966. The Pietà by Michelangelo is yet another emotional work: an unfinished group representing Mary and Mary Magdalene holding the corpse of Jesus, with a huge Nicodemus embracing the two desperate women. The unfinished work, made by Michelangelo in his 60s, was made by the artist to decorate his own tomb and in Nicodemus Michelangelo executed a self-portrait. From the Tribune of Michelangelo, you can head straight to the exit. You have seen enough masterpieces to justify the price of the ticket already, but if you do this, you don’t know what you’re missing. There are two more floors, filled with more beauty. As soon as you reach the first floor, you will be introduced to the Campanile Gallery, a room where you can see all the original panels and statues decorating Giotto’s Bell Tower (replaced by copies on-site). The panels are mostly works by Andrea Pisano, made in the first half of the 14th century. They represent the human activities, as a symbol of the progress of the mankind made possible by the Christianism. The statues are also in part by Andrea Pisano while some more, made one century later, are by Donatello and other early renaissance artists. 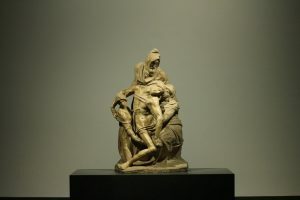 This gallery is probably the best place in the world to understand the difference between Gothic and Renaissance sculpture, as long as understanding the evolution of the Renaissance from early new artistic trend to a mature style which still irresistibly attracts us. 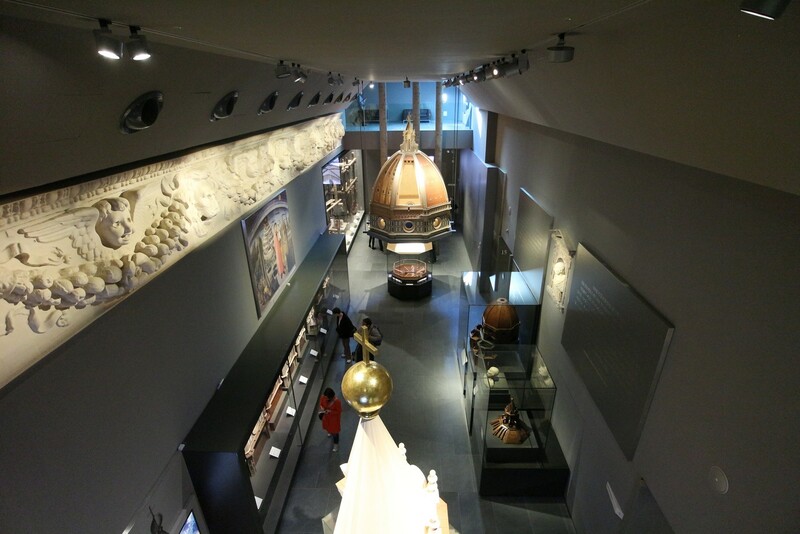 From the Campanile Gallery, you can directly access the Dome Gallery. 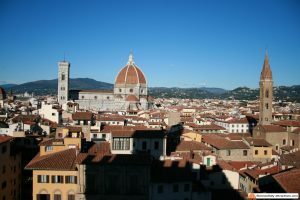 Here you can see everything related to the greatest Renaissance architectural achievement: Brunelleschi’s Dome. Examples of the machines invented by Brunelleschi to facilitate the construction, a model of the dome, a model of the lantern, and original models of the decoration which was never finished. A video is played (alternatively in Italian and English) to explain the technical details of the construction. The next room contains paintings that once decorated the Cathedral, and from here you can take two directions: to the right, you can reach a series of small rooms with 19th-century projects for the new facade of the Duomo; to the left, you can reach the hall of the cantorias, the “singing-galleries” which were made by Donatello and Luca Della Robbia. Prepare to be stunned again, because the very next room is the Treasure room, containing the precious fabrics, a silver cross and the gorgeous cover of the Baptistery altar which the Republic of Florence used to decorate the Baptistery on the John the Baptist feast. The silver altar, featuring a small statue of the Baptist and 12 bas-relief panels representing stories of his life, is a work by various artists made in the span of almost 150 years (1337-1483). Among the big names that contributed to this work, the most famous are Michelozzo and Andrea del Verrocchio. One more gallery awaits you at the second floor, it shows the original models for the new facade of the Duomo, made in the late 16th/early 17th century, after the original facade (the one rebuilt at the ground floor) had been torn down in 1587. Here you will also learn how in those times they used to build and paint temporary fake facades to celebrate important events. For example, you’re going to see some huge statues representing bishops and made in plaster, which decorated the fake facade made to celebrate the wedding of a Grand Duke of Tuscany. This floor is also dedicated to relaxing. There are two terraces with sofas looking down at the Dome gallery, and a large window which allows you to see again the large Paradise hall from a privileged position. There would be a roof terrace, with a beautiful view on Brunelleschi’s Dome, but when I went there it was closed. One of the guardians told me that it would require a person to safeguard the terrace, and for that reason it was closed, probably because there were too many people into the museum. I’ll be back there many times, and will keep you updated on this terrace: I hope this is not the case, but it might be that it is open only on special days. 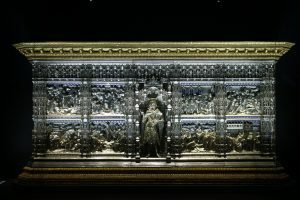 A description of the brand new Opera del Duomo museum in Florence.